Our association consists of nearly 120 residences near the corner of Craigleith and Fischer Hallman in Waterloo, ON, CA. The association’s main task is the management of the pool and tennis facilities as well as the surrounding park lands. When people ask where I live, I like to say “In Craigleith” — a small neighbourhood nestled among the Beechwoods. We have many characteristics in common with our surrounding communities but we have a unique history that sets us apart. The neighbourhoods in this part of Waterloo were planned around community associations and linear parks. These were radical ideas at the time that resulted in higher list and that skeptics said would never sell. Major Holdings introduced the approach and found it highly successful, so much so that when a competitor Freure Homes purchased the Frank farm, on which Craigleith was eventually built, controversy broke out. Freure proposed a conventional sub-division that included placing Clair Creek in a storm sewer from Fisher Hallman Road to Craigleith Drive. The surrounding homeowners objected, City Council was sympathetic, and the present plan was developed as a result. We have much more interesting trees and shrubbery in our park area and I have often wondered if hat is a consequence of the attention the subdivision attracted. The path from plan to completion was not smooth, however, and this explains our housing mix. Freure built fewer houses on Tatlock Court before, in one of the inevitable land development business cycles, it offered the subdivision for sale. Some individual lots were sold, but the bulk of the land was purchased by Major Holdings. Major Holdings normally worked with 10 custom homebuilders but, in our case, decided to offer the opportunity to two large contractors Costain Homes (Tatlock Court and Drive) and Monarch Construction (Faraday, Beechlawn, and Craigleith Drive). No buyer was forthcoming for the condominium land on the side of Clair Creek. Major Holdings asked the five families already here to revise our future community association by-laws to be similar to the surrounding sub-divisions. The fact that our Association functions differently and I think better is a credit to their foresight as declining the request. 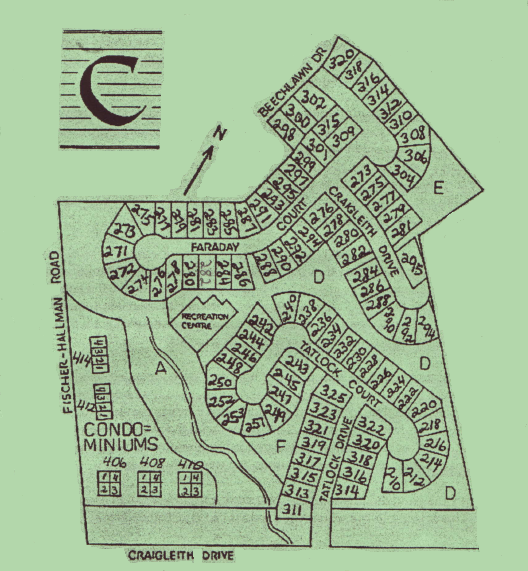 The neighbourhood was substantially completed by spring 1980 and the Craigleith Homes Association was established. That too has a story. We were the smallest association to be started up to that time and furthermore the probability of the condominium land being developed for some time was low. We insisted we needed financial help from the developers and our founding Board refused to accept title to the pool and threatened to apply large initiation fees to unsold lots, of which there were still a number. Negotiations went on for about a month while everyone sweltered in the summer heat. 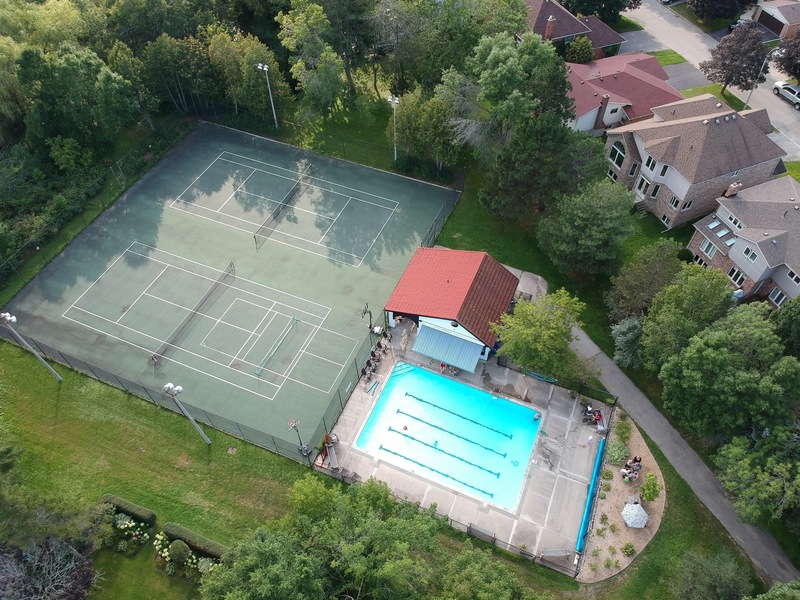 The result was a substantial cost settlement, which we used to improve the tennis lights, to obtain a pool heater and to set up a reserve fund and an extended warranty on the pool and the pool house. This was invoked by a later Board to get repairs to settlement and frost heave damage at the Recreation Centre. Clair Creek is a special feature of our Community. The residents of surrounding Associations saved it from becoming a storm sewer but the grading plan called for the creekway to be backfilled and graded and to establish grassed areas except within three meters of the creek itself. No one thought of natural regeneration at the time but our early Parkland Committees fought hard to keep the Creek natural. Now our section of the Creek is used by City staff as an example of successful stream management. Our Community was completed in 1984 when Freure Homes purchased the condominium lands from Major Holdings’ successors and built the five four-unit complexes in the south-west corner. Considering the degree to which we have stubbornly charted our own courses, it seems appropriate to me that we have a Scottish name. It also seems appropriate that we are not Beechwood-something.